Address: Széchenyi István tér 5-6., district V.
The Four Seasons Gresham Palace is one of the best luxury hotels in Budapest. Owned by the Canadian Four Seasons group guests of this magnificent palace hotel in downtown Budapest will get exceptional high standard services while enjoying the best panoramic view a hotel has to offer. The Travel & Leisure magazine ranked it 15th on the Top 100 Hotels in World list in 2007, while the hotel finished at 2nd spot among European Hotels. The Condé Nast Traveler magazine said that the Four Seasons Hotel Gresham Palace was one of the best hotels in the world in 2005 and 2006. 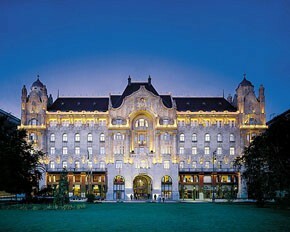 Four Seasons Gresham Palace stands on Széchenyi Square on the Pest side of the Danube embankment. The location cannot be more superb offering a combination of beautiful vista of the Danube with the Chain Bridge and Castle Hill on the opposite side of the river and many key attractions in close proximity. places of entertainment within easy access. The famous Váci utca shopping street is just a few blocks from Four Seasons Gresham Palace starting on Vörösmarty Square where the Christmas Market is held in every December. You can get to Budapest largest church St. Stephen’s Basilica in a few minutes on foot. Should you need to use public transport to reach farther parts of the city the Deák tér metro station ( 3 metro lines of Budapest meet there) is about a 10-minute walk while the M1 underground line stops at Vörösmarty Square. Tram 2 runs along the Danube on the Pest side and it has a stop at Széchenyi Square. The building of the palace was commissioned by the Gresham Life Insurance Company and the construction was finished in 1906. The stunning Art-Nouveau architecture of the palace was praised all over the world even then. The most talented craftsmen were invited to work on the building. Unfortunately bombings during World War II did a lot of damage to the building. During the 5-year reconstruction project overseen by the Four Seasons chain much of the original architectural elements, art and decor have been beautifully restored providing elegant and refined environment for guests of the upscale hotel. 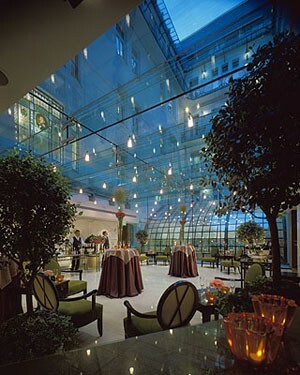 Even if you don’t stay in the Four Seasons Hotel Gresham Palace, do drop by and visit the magnificent lobby with its vaulted glass roof. The hotel has 179 rooms including 17 suites all decorated in stylish yet modern taste providing all modern conveniences to pamper guests. 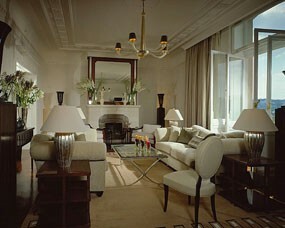 Tower Suite (64 sq.m) – the bedroom is located in the dome of the palace’s, 5 steps up from the living room area. All suites have spacious work area with writing desk, sofa, armchairs, large bedroom, and marble bathroom with deep bathtub. Bathrooms are stocked with L’Occitane toiletries. All of the suites offer splendid views of the the Danube, the Chain Bridge, the Royal Palace, the Buda Hills, and the Fishermen’s Bastion. A new dining palce opened in the place of the formal Páva restaurant in summer 2015. KOLLÁZS boasts a superb, well-thought-out Art-Deco interior evoking the ambience of the 1920-s.
Lots attention were given to every detail and only the highest quality of materials (marble from Italy, cement sheets from Marrakesh, steamed acacia wood floor by Hungarian craftsmen) were used to create a refined, understated elegance. Despite the 5-star hotel location the bisro has a relaxed ambience and the waiting staff is kind and attentive. KOlLÁZS is among Budapest’s premium dining places for sure. They have breakfast menus (continental for 7 900 HUF, American for 9 700 HUF) along with specialties like goose liver and wild mushroom omelette but you can also choose a la carte. 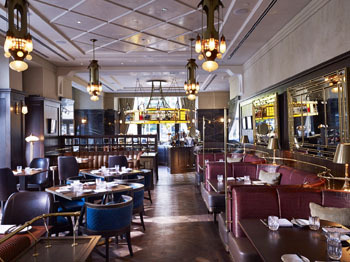 The lunch and dinner menu represents a collage of Hungarian and international dishes. There’s also a charcoal rotisserie where grilled meat and fish dishes are prepared. The wine list is extensive showcasing the best of Hungarian wines as well as international bottles. The top floor of the Gresham Palace houses modern spa allowing guests to refresh and revitalize by rejuvenating massages and treatments in 7 private rooms. There’s also an indoor pool (39 m long) and a small whirlpool adjacent to the spa center. Spa facilities are open between 6.00-22.00 every day. 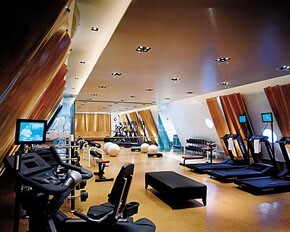 The fitness center (named Health Club) has top-notch work-out equipment. Certified trainers help guests with their work-out. Other Spa & Wellness Hotels in Budapest. The Four Seasons Hotel Gresham Palace has a business centre on the ground floor providing services and facilities all day round that business travellers need. The Four Seasons Gresham Palace is family friendly hotel with all kinds of services to pamper the younger ones. Children under 18 can share their parents’ room free of charge. For the most little ones a reliable baby sitting service (for an hourly fee) can be arranged within 6 hours upon request. Crib and/or roll away beds are provided without extra charge along with diapers, wipes, lotion, shampoo, baby bathtub, high chairs, games, books, colouring books, crayons etc. Child size bathrobes, toiletries for children, children’s menu are also provided. TIP: see more recommended things to do for children in Budapest. The Four Seasons Hotel Gresham Palace has a range of meeting and event rooms , 3 on the ground floor and 6 on the Mezzanine floor. The largest and most spectacular is the so-called Télikert with its glass roof ceiling. One of the side walls is also glass adding bright and aerial feeling. The room has all the modern technical equipment a conference or large meeting might need. Apart from business purposes, the meeting rooms are perfect for social events including wedding parties. See other hotels in Budapest recommended for business travellers. 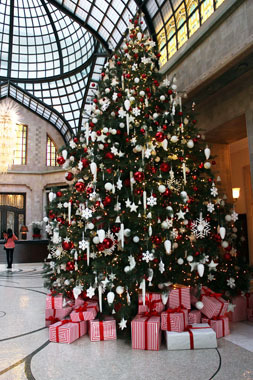 The hotel has unique events and programs in the festive season. The whole palace is decked out in spectacular Christmas decorations and the new KOLLÁZS Brasserie & Bar prepares with special melas and menus for the Christmas period. Celebrate the end-of-the-year holidays in style! Christmas Dinner with entertainment on December 24. Christmas Brunch with entertainment on December 25. New Year’s Eve Dinner with entertainment on December 31. New Year’s Day Brunch on January 01. The offer excludes taxes (18% VAT and 4% Tourism Tax on room charges and 27% VAT on food and beverage charges). Cancellation policy: rooms may be cancelled without charge until 6pm local time, 7 days prior to arrival. Check rates and read reviews by travellers! A fabulous 5-course dinner will be served in the hotel’s brand new restaurant on Christmas Eve. Live gypsy music provides the tunes to the special event. Foie Gras Tarte with Quince, Chestnut Cream Soup with Coquilles, Lamb Stuffed Cabbage, Pike Pearch with Puy Lentil and Caramelized Onion or Venison Duo with Parsnip and Pear, Buche De Nöel. Price: 25 000 HUF/person, or 33 000 HUF/person with wines recommended by the head sommelier. 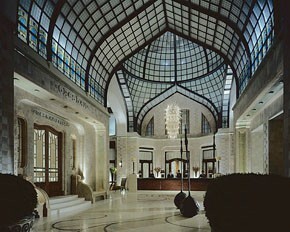 The Fours Seasons Gresham Palace is one of the best rated hotels in Budapest. Tourists who slept in this hotel all praise the fantastic central location and the wonderful view of the Danube with the Chain Bridge. Interestingly a lot of travellers have found the rooms large enough and furnished in great taste, some of them however have complained that the rooms are too small. Also some people said that the rooms are not standard Four Seasons but they have character and exude understated elegance. The palace in itself is impressive and represents one of the finest examples of Art Nouveau architecture in Europe. The gym is said to be very well fitted. Many reviewers were satisfied with the excellent concierge service. The fix priced airport transfer (cc. 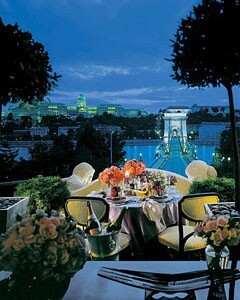 5500 HUF) is another plus offered by the Four Seasons Hotel in Budapest. spacious, well-equipped spa & fitness center occupies the entire top floor: 7 private massage rooms, unisex sauna, separate steam rooms for men and women. There’s a complimentary newspaper and housekeeping is done twice a day. Aria Hotel Budapest – music themed luxury boutique hotel at the Basilica. Sofitel Budapest Chain Bridge Hotel -riverside, 5-star hotel in the centre. Buddha Bar Hotel Budapest in Váci Street – historic palace hotel in the city centre. Boscolo Hotel Budapest Autograph Collection – lavish palace hotel on Grand Boulevard. Corinthia Budapest Hotel – historic, 5-star, on Grand Boulevard. Iberostar Grand Hotel Budapest -Luxury boutique hotel near the Parliament. Hilton Budapest Castle – great views of the Pest side. St. George Residence All Suites Hotel – excellent for luxury, romantic styas in Buda Castle.